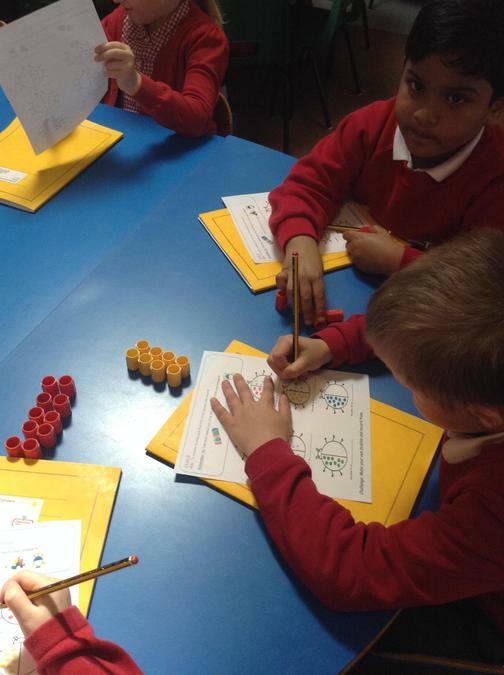 This week in Maths we have been doing lots of work on our number bonds to 10 pairs of numbers that make 10. 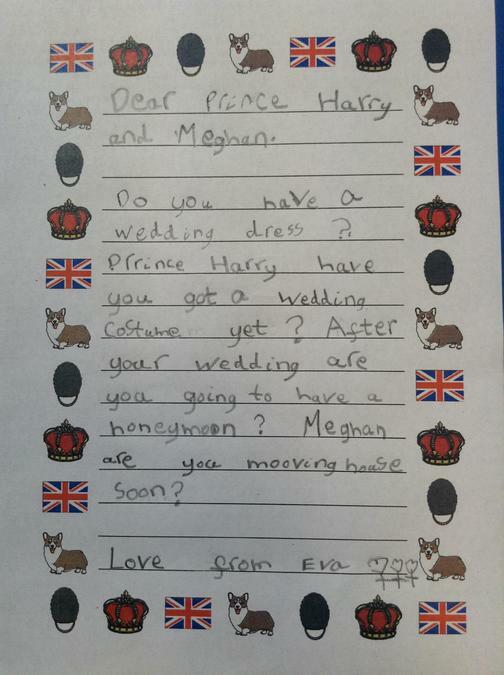 For our English work we have written newspaper reports including lots of information about the royal wedding. 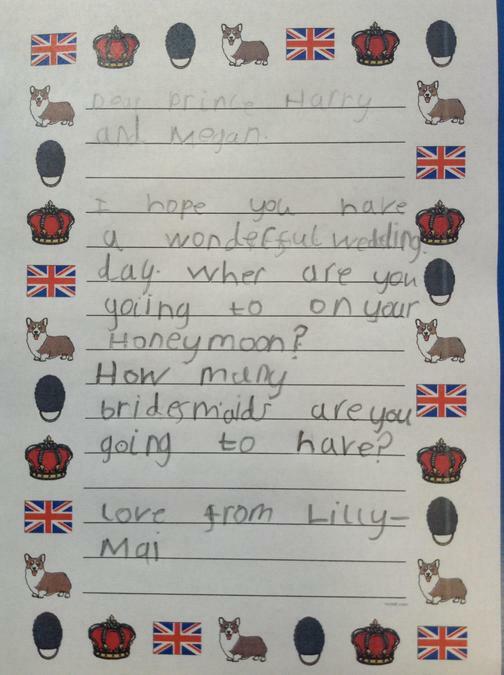 The following day we wrote thank you notes for our wedding celebrations on Friday. 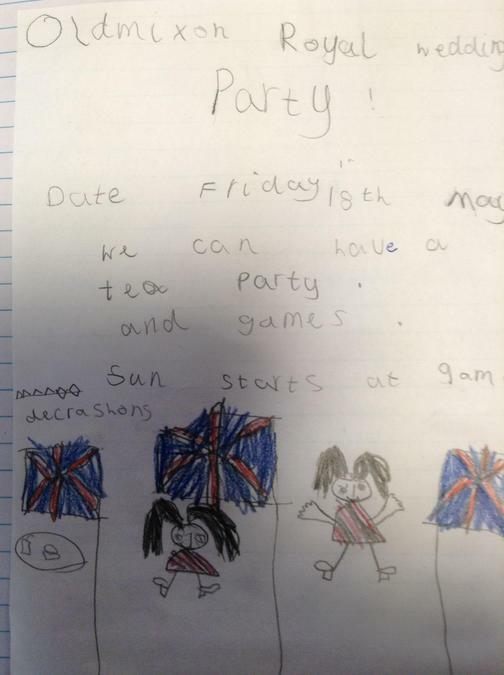 We have also written lots of facts about what we have been learning this term all about London and the Queen. 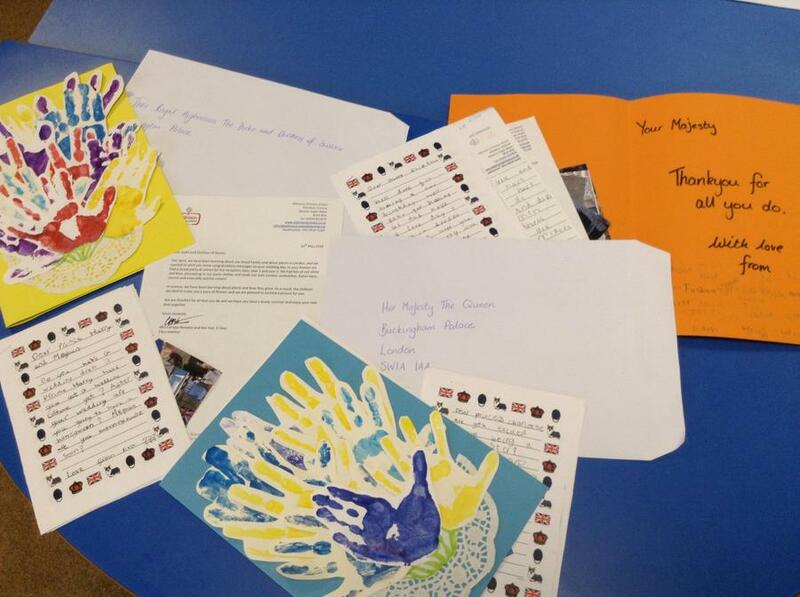 We have finished of our cards to the different members of the royal family and have posted them this week. 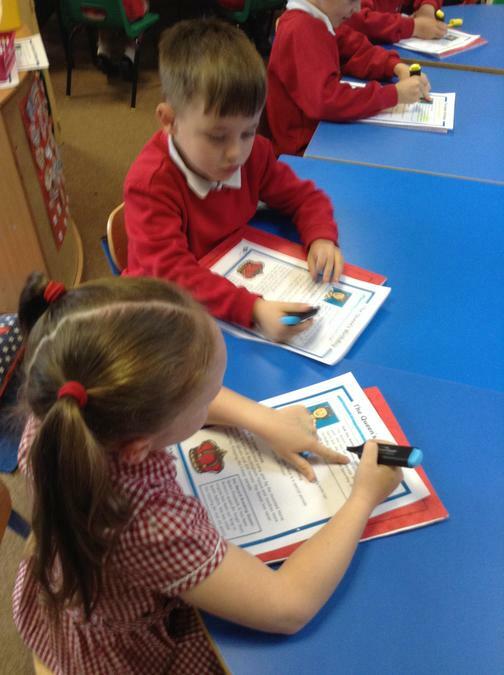 This week in Maths we started the week by recapping our left and right from last week to help us with our directions. 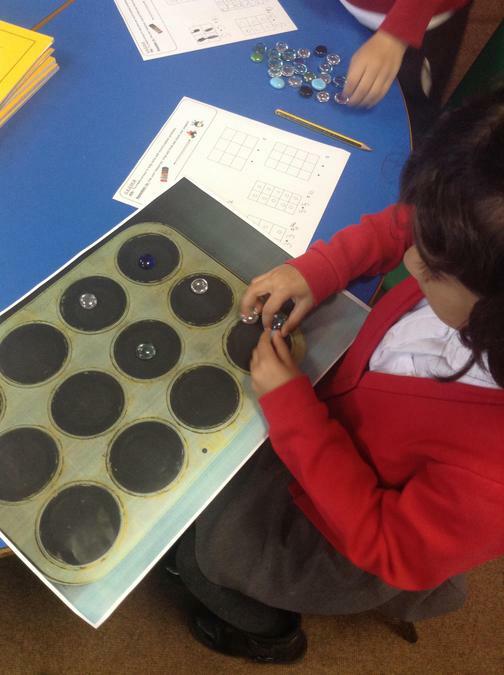 Then we have been working on turns a quarter turn, half turn, three quarter turn and a whole turn, we used numicon to help us by drawing around it to show the different directions. 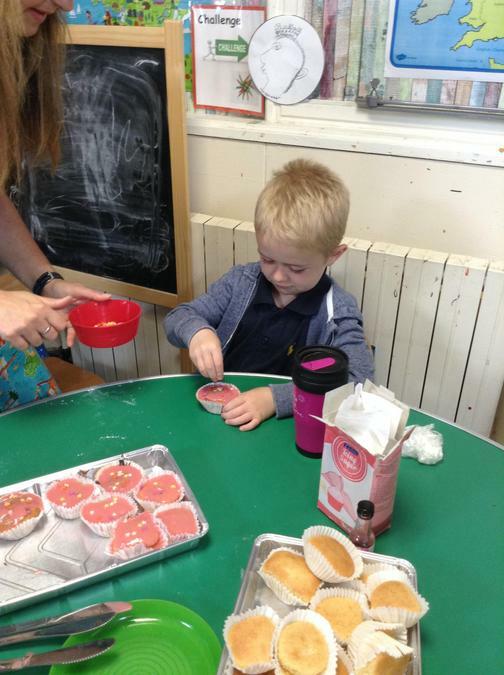 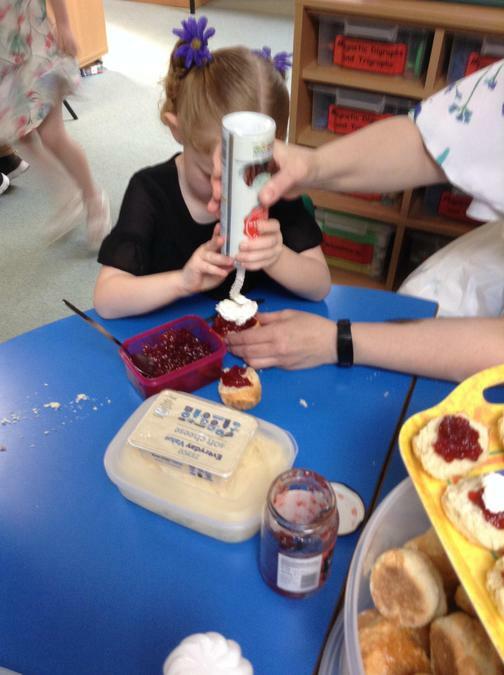 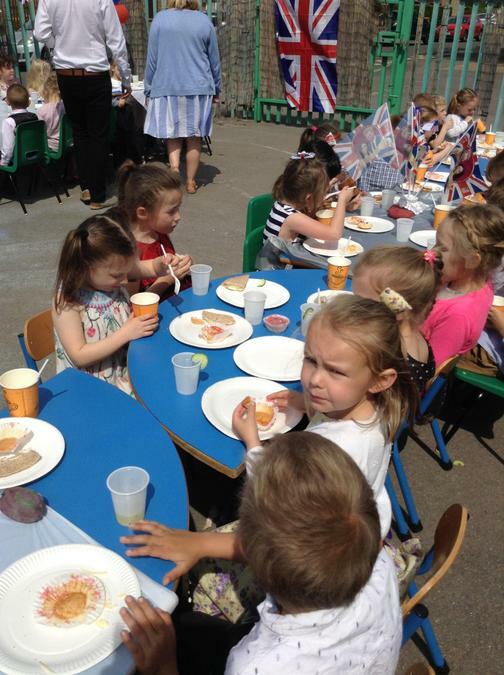 For our English work we have written instruction to make scones and then made them. 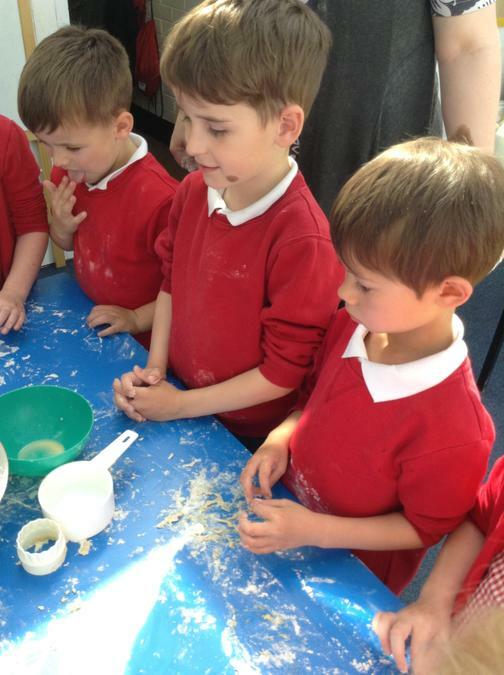 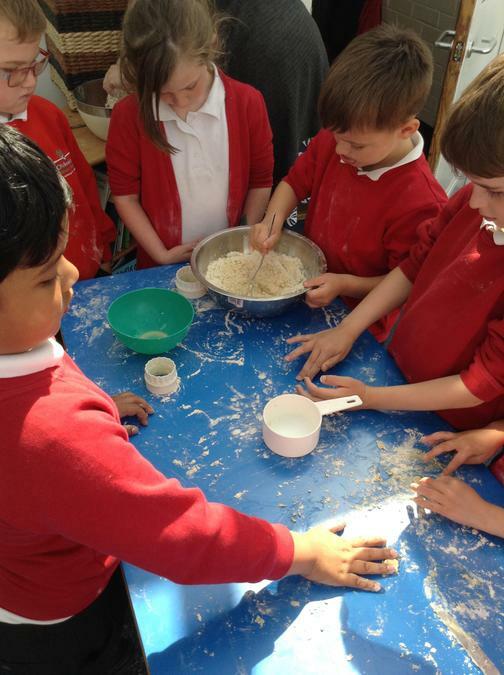 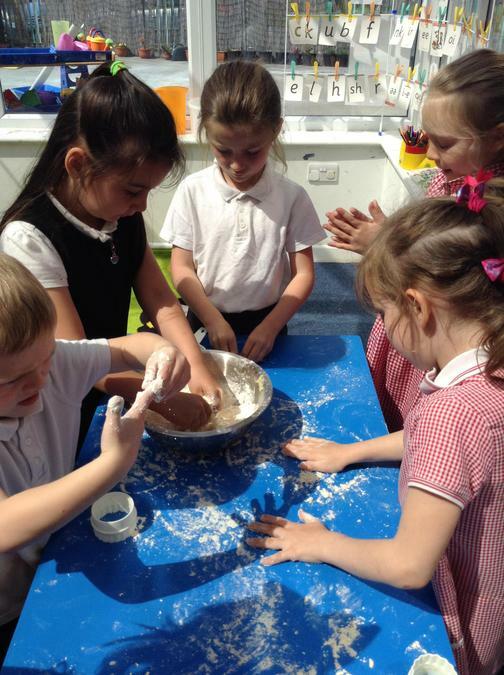 We used sugar, butter, milk, eggs and flour and mixed them together. 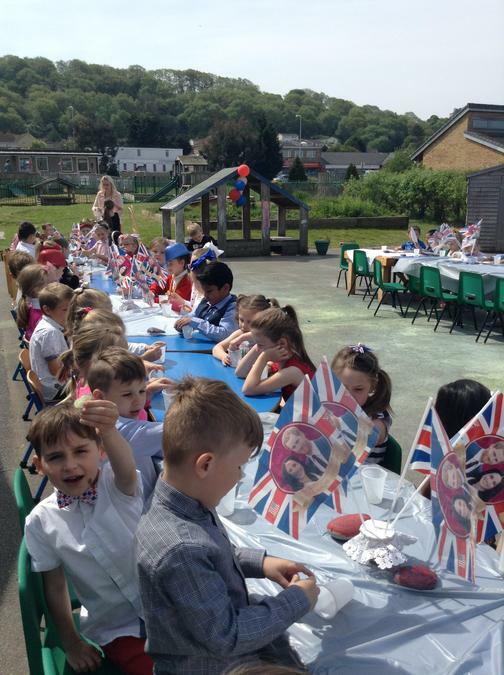 We have also written invitations for our Royal Wedding Celebration. 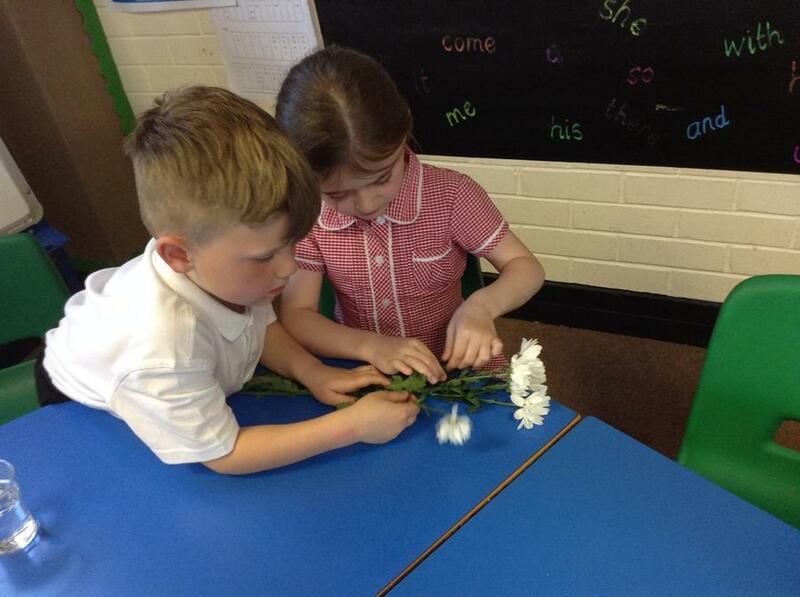 In our Enquiry work we have looked at flowers and how they can be changed with dye. 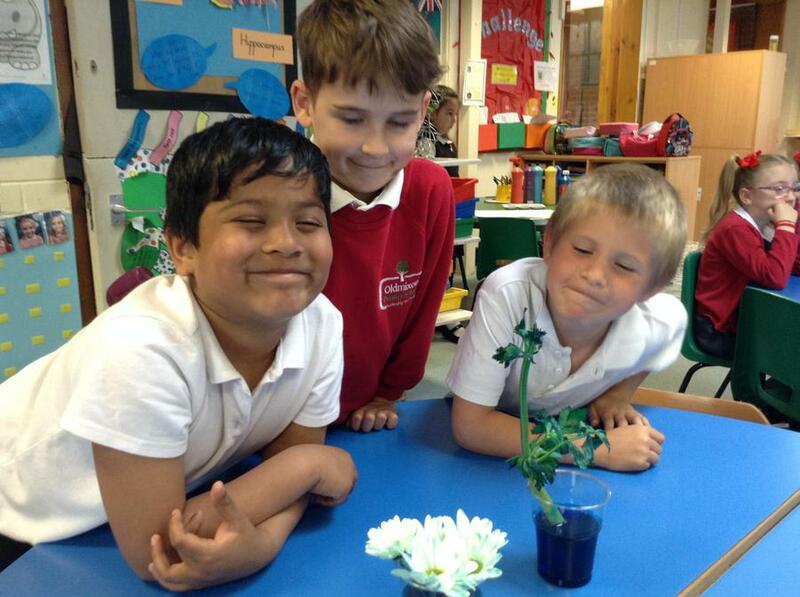 We used food colouring in water with flowers and celery and waited over night to see what had happened. 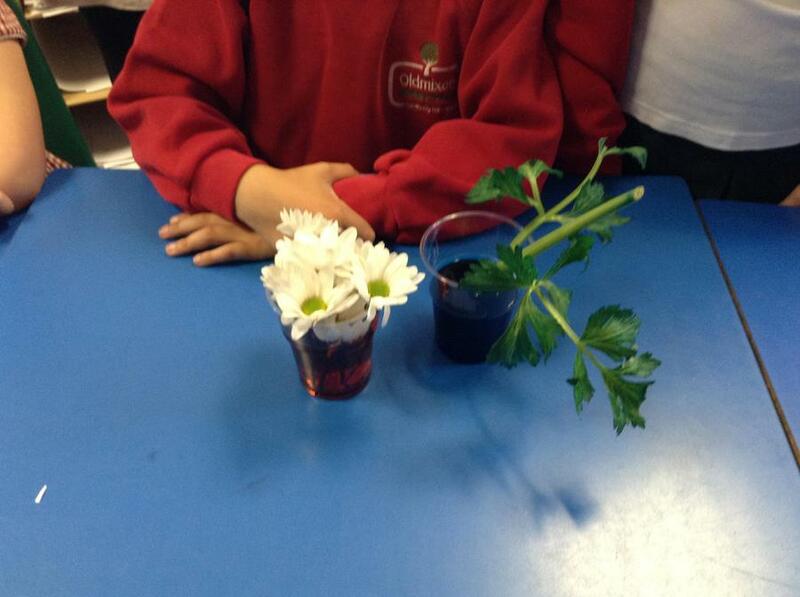 The flowers and celery had absorbed the food colouring and it changed the colour of the flowers. 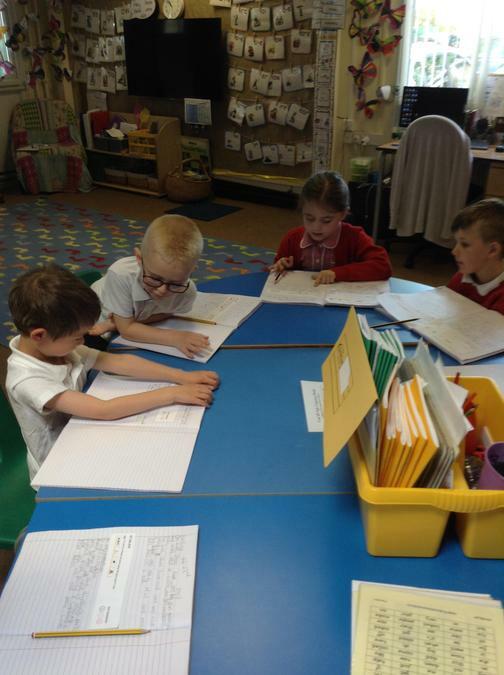 We have been very busy this week for our English work we have found out lots of information about the Queen and wrote out all the fascinating facts that we found. 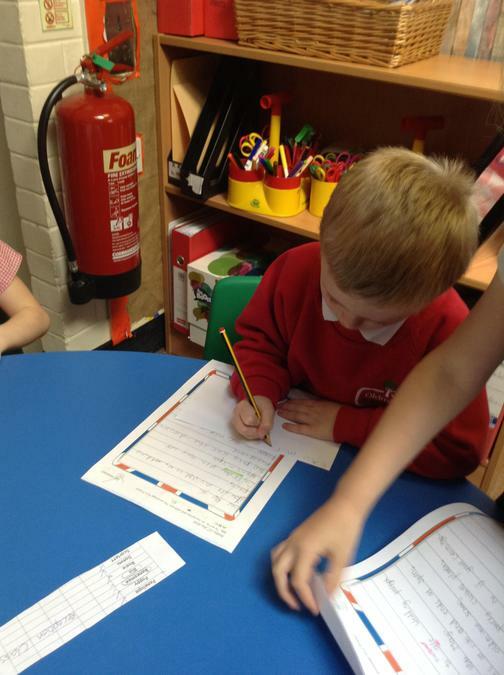 We have also written our own letters to different members of the Royal family. 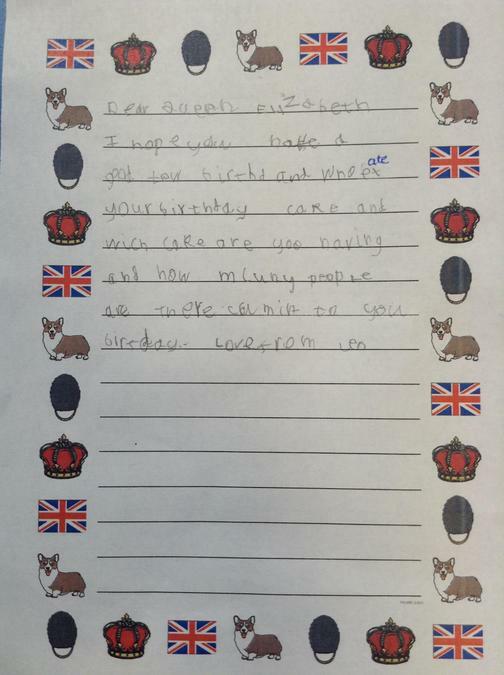 We wrote to the Queen about her birthday, to Prince Harry and Meghan about their wedding or the Duke and Duchess of Cambridge about the birth of Prince Louis. 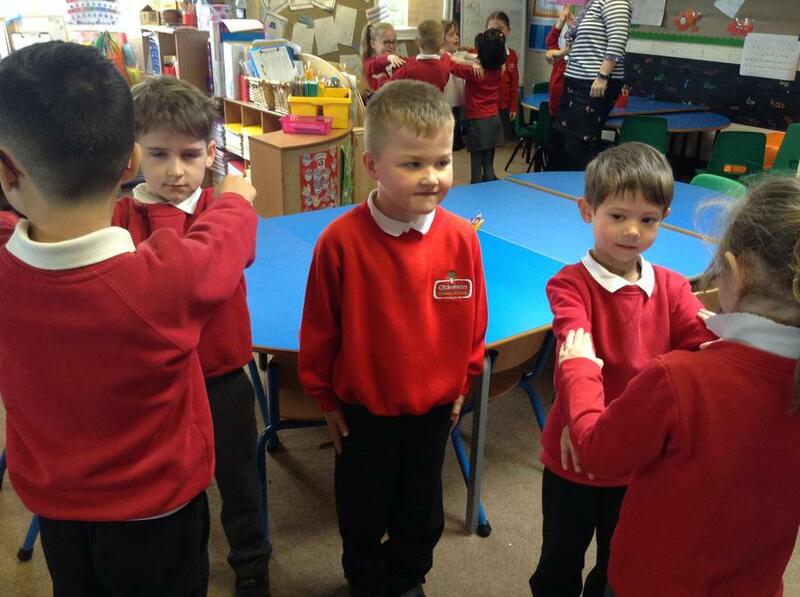 We have been working on our left and right this week in maths. 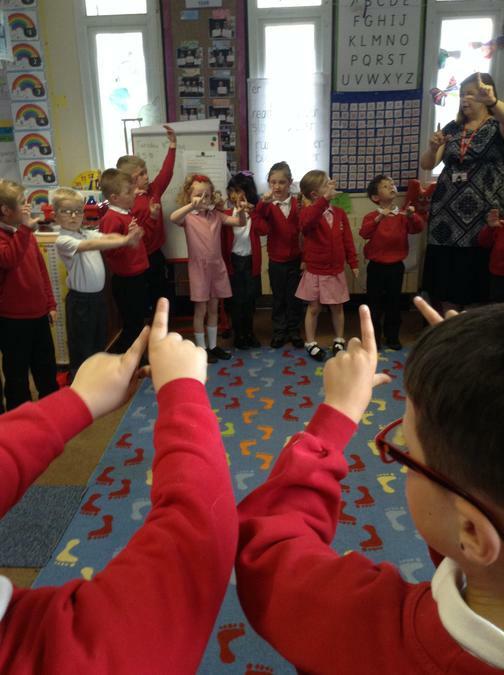 We practiced a few different songs that helped us to learn our left and right. 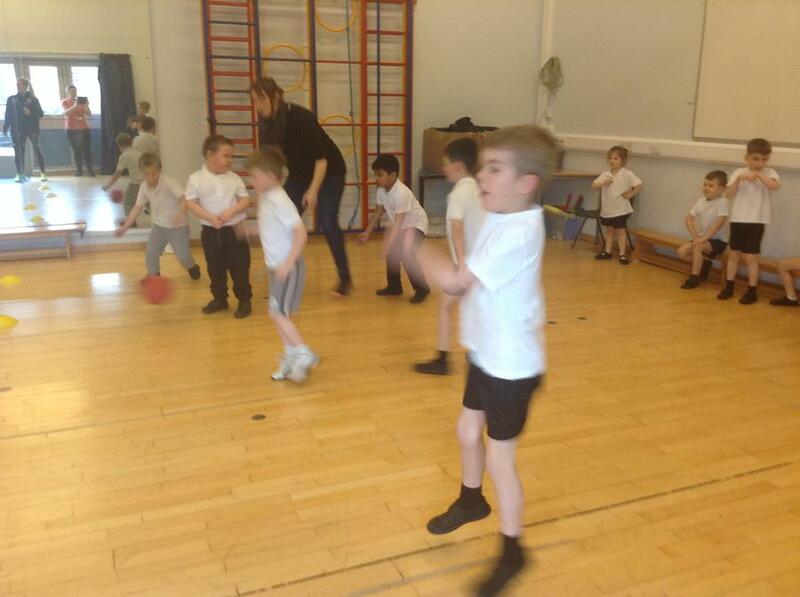 We have also worked on positional language for direction. 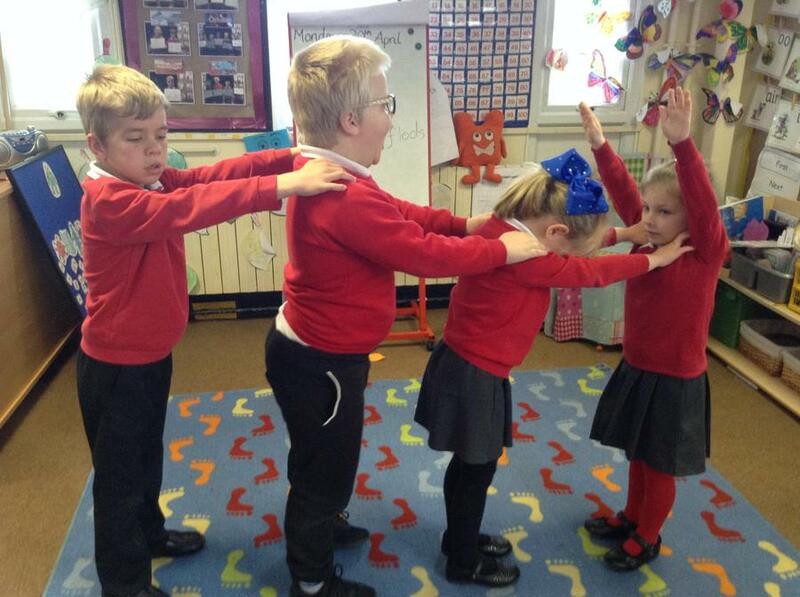 We now know up, down, under, inside, behind, next to and between. 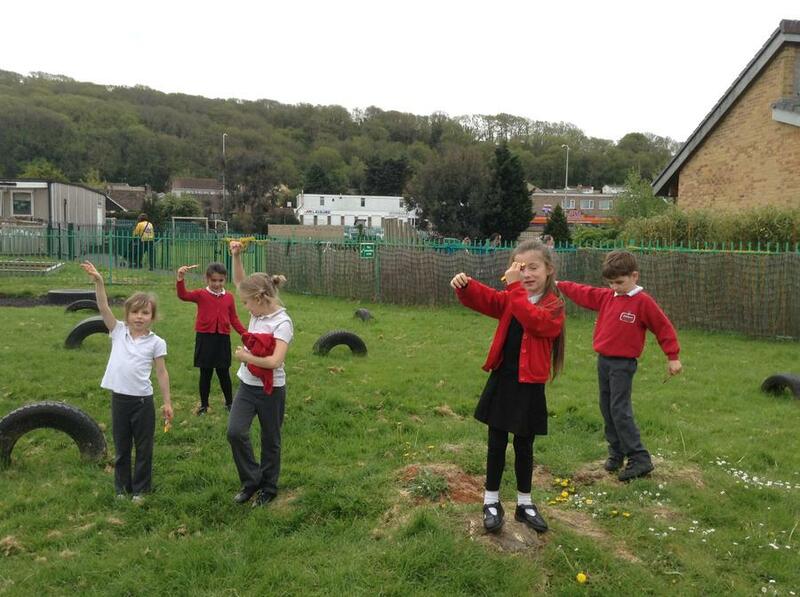 We used these directions to find treasure outside. 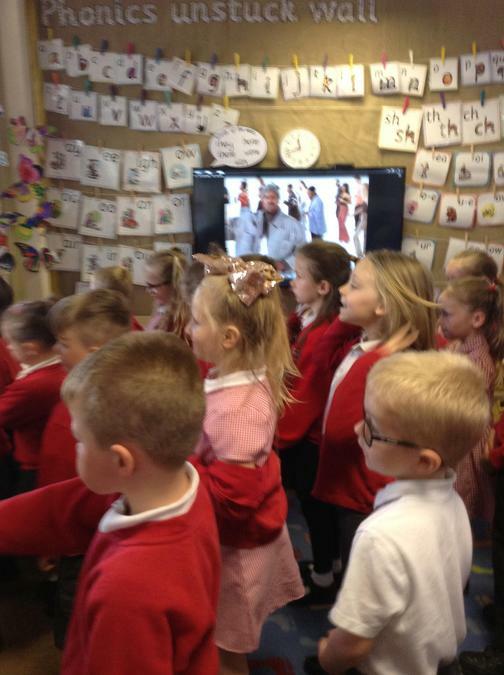 This week in English we have been looking at a new story called the Queen's Handbag. 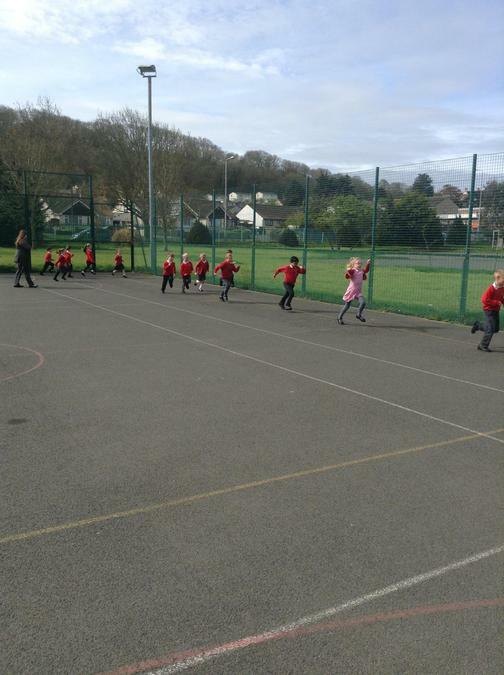 A sneaky swan steals the Queen's handbag and she chases him around lots of different places in the UK trying to catch him and get it back. 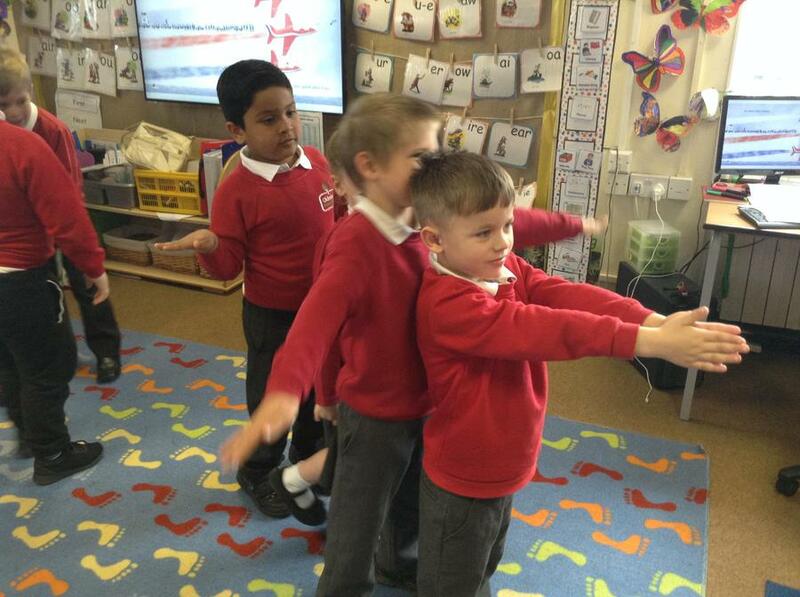 We used our bodies to make some of the different places. 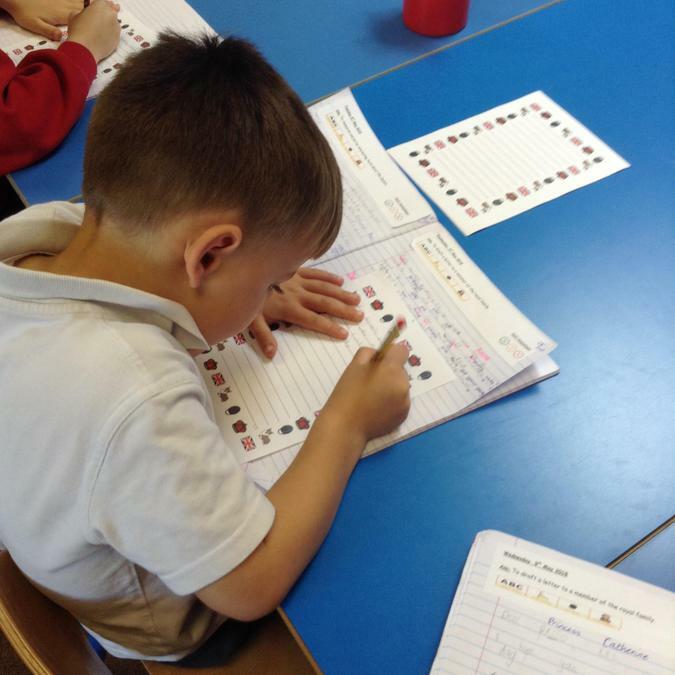 We then wrote the story concentrating on the beginning, middle and the end. 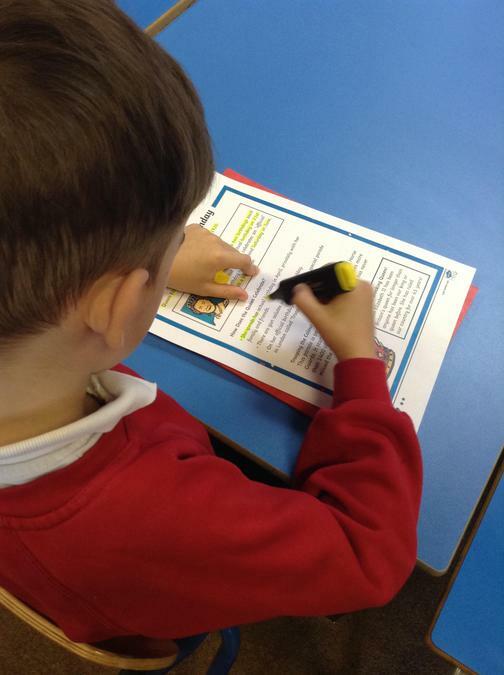 We have also wrote our own stories this week with a different character and something that was stolen. 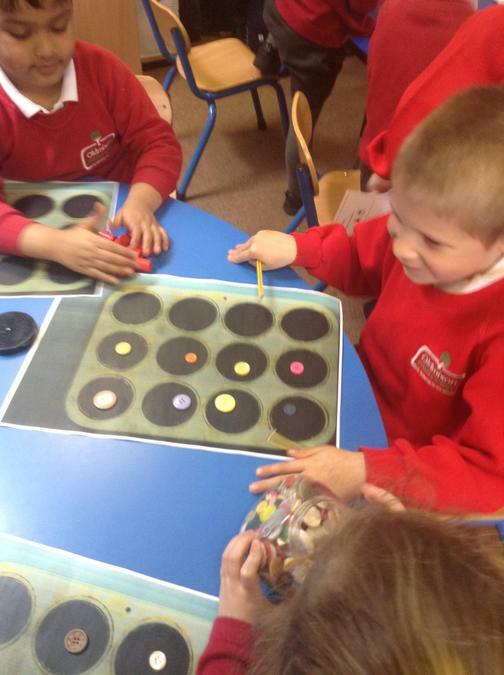 In our Maths we have been working on looking at different object and find a half 1/2, Quarter 1/4 and a whole. 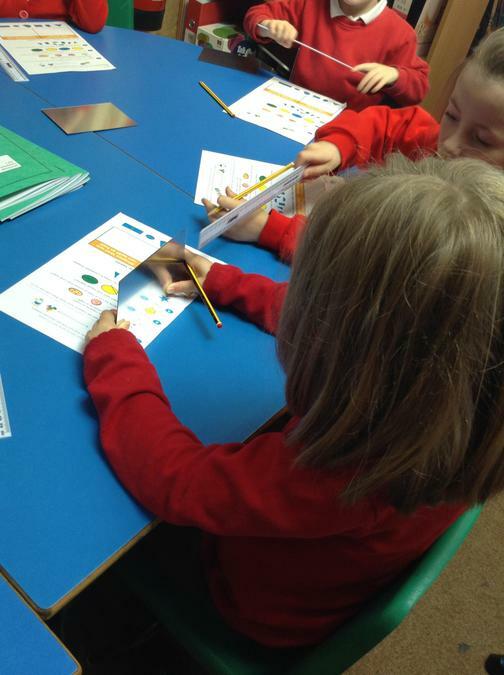 We used cuisenaire rods to help us find an equal part of a larger rod. 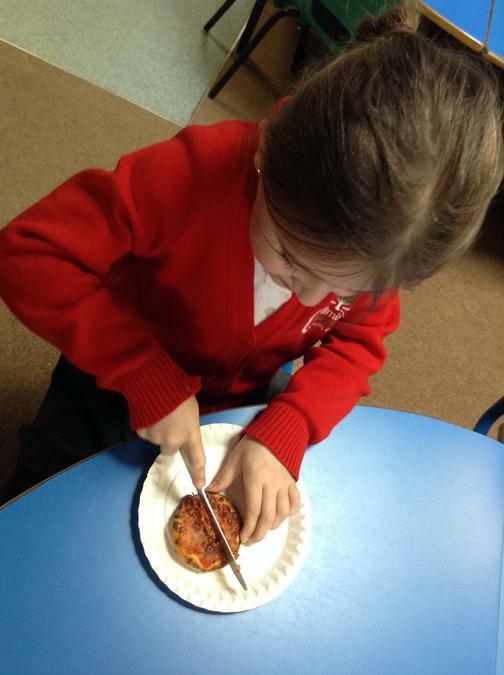 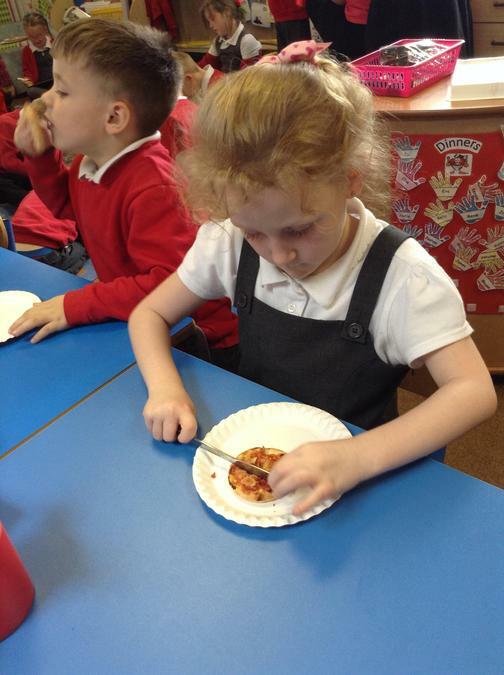 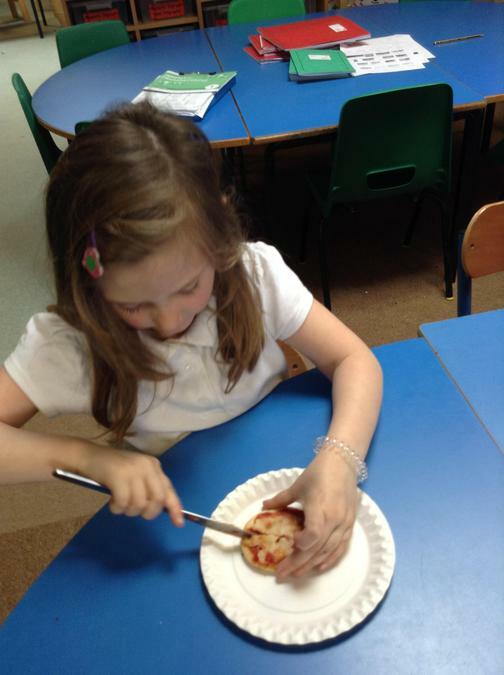 We have looked at different shapes and found a half using a mirror and we also used pizza's to help with our work. 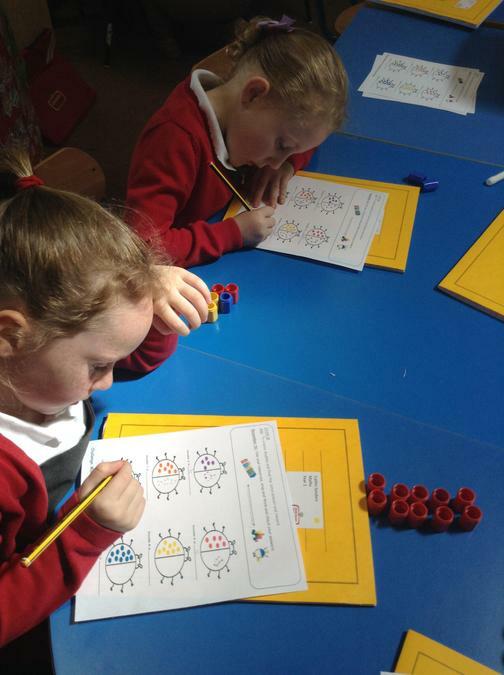 This week in Maths we have continued working on doubling numbers and writing out our different number sentences. 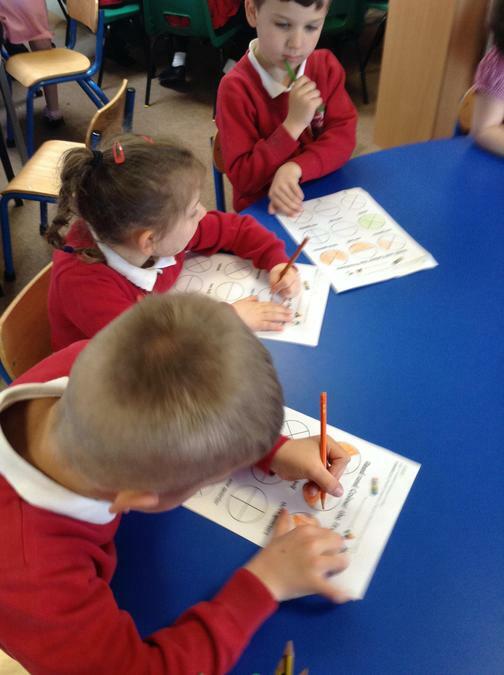 We have also worked on separating a number into equal groups and writing out the number sentences. 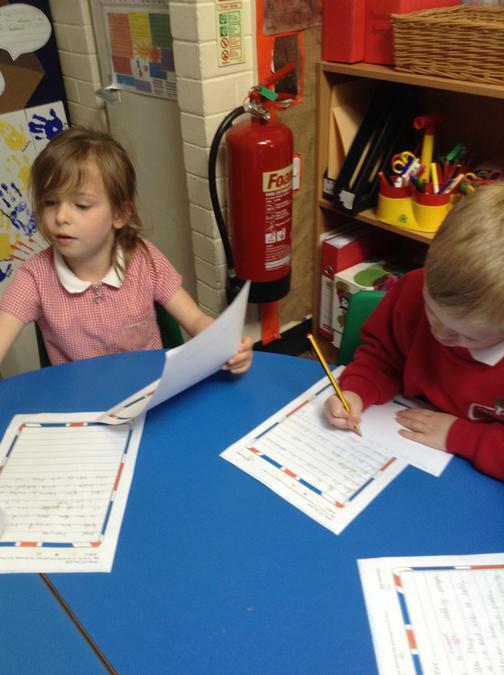 For our English work this week we have written descriptions about running in the London Marathon. 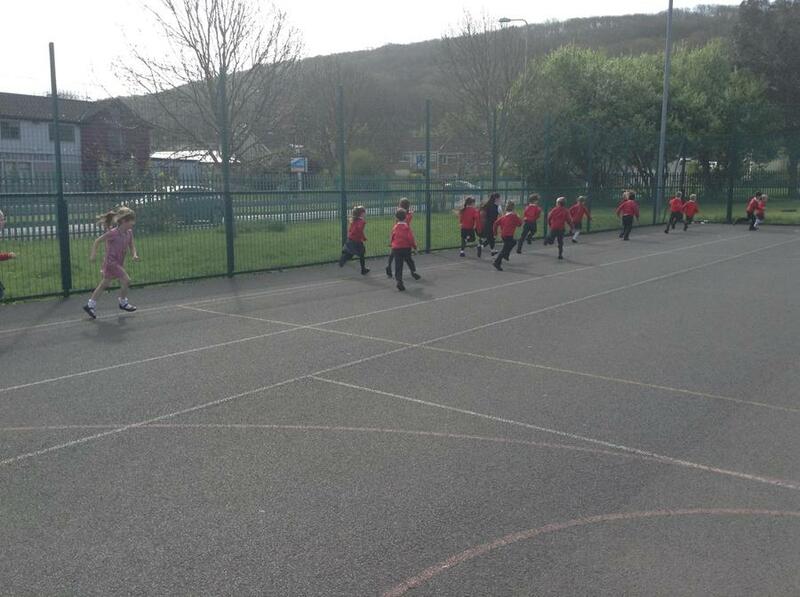 We thought about the different places we would pass and how we would feel running all that way. 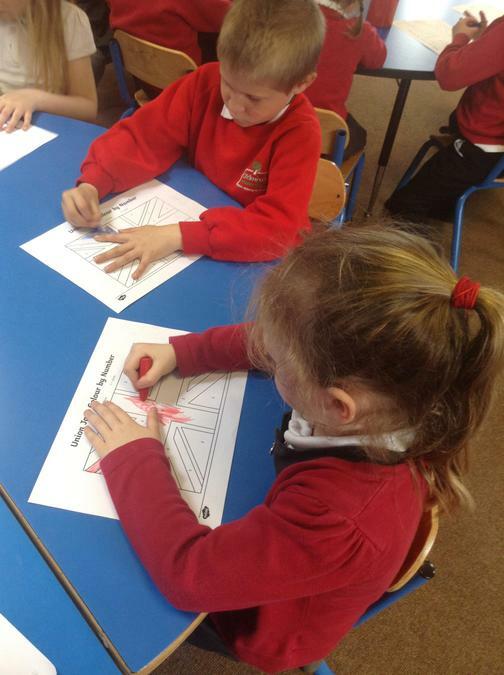 We have also worked on describing different buildings in London such as Big Ben, Tower Bridge, St Pauls Cathedral, The London Eye, Buckingham Palace and The Dome. 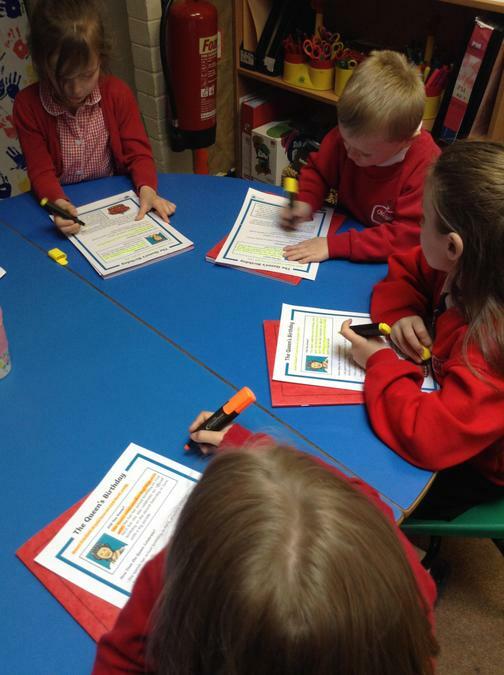 We have written our own letters to the Queen asking her different questions that we would like to find out the information for. 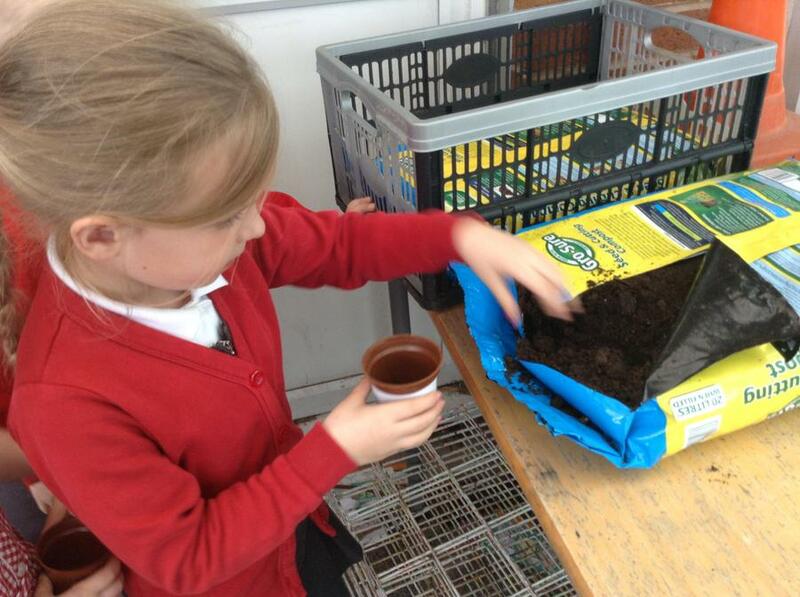 This week in our Enquiry work we have planted Beans, Sweet peas and Cress. 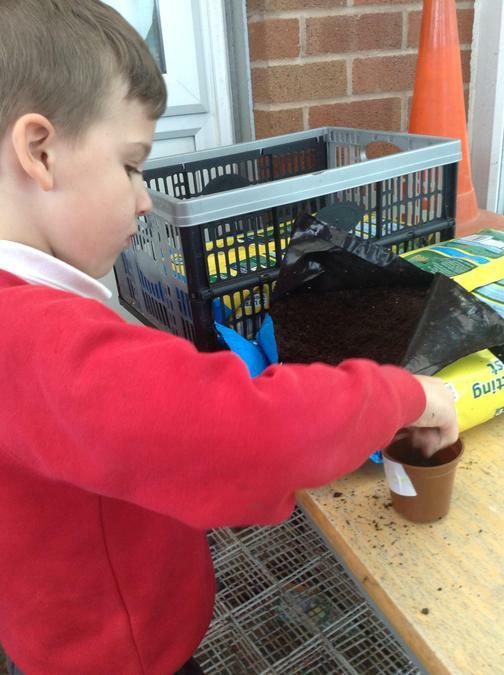 We also thought about what our seeds would need to grow and decide to plant some seeds with no water, some with no sunlight and some with no soil. 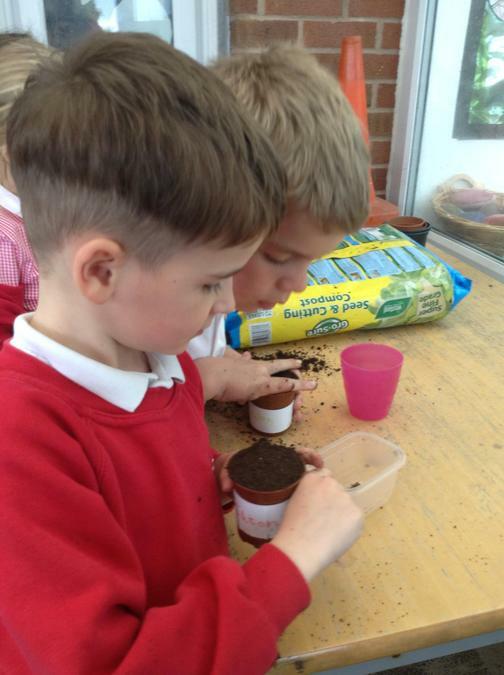 Then we planted seeds with soil, sunlight and water. 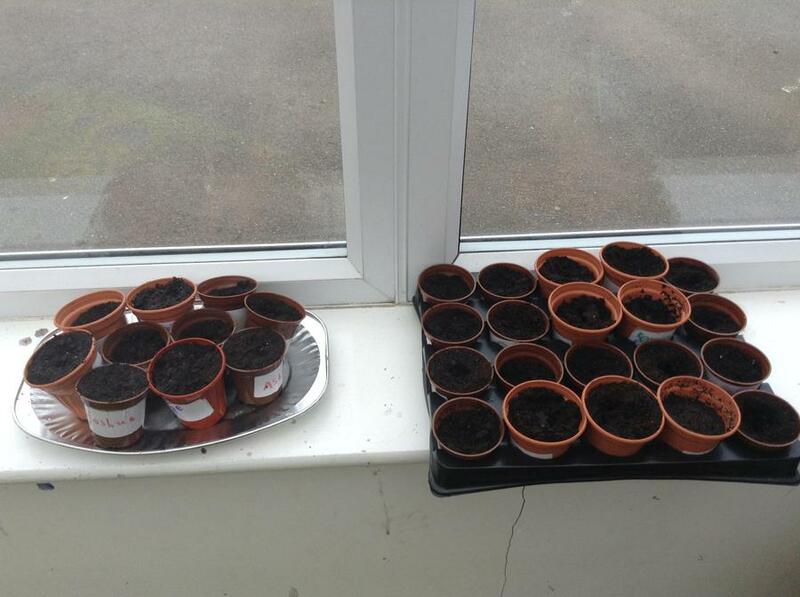 Now we have to wait and see what happens to them. 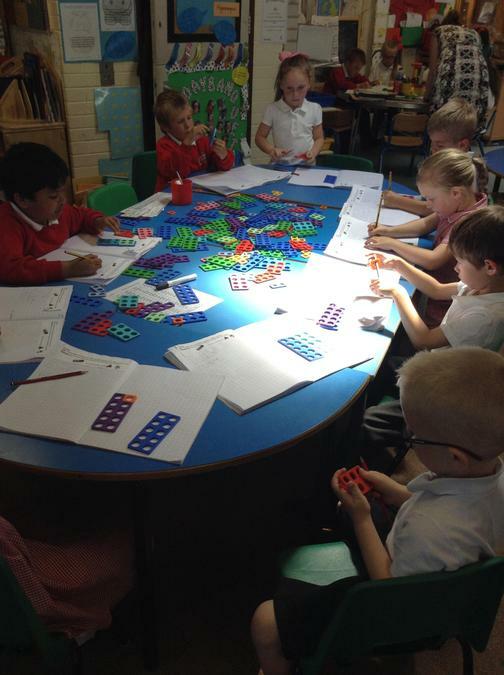 This week in Maths we have been working on lots of different ways to look at number problems. 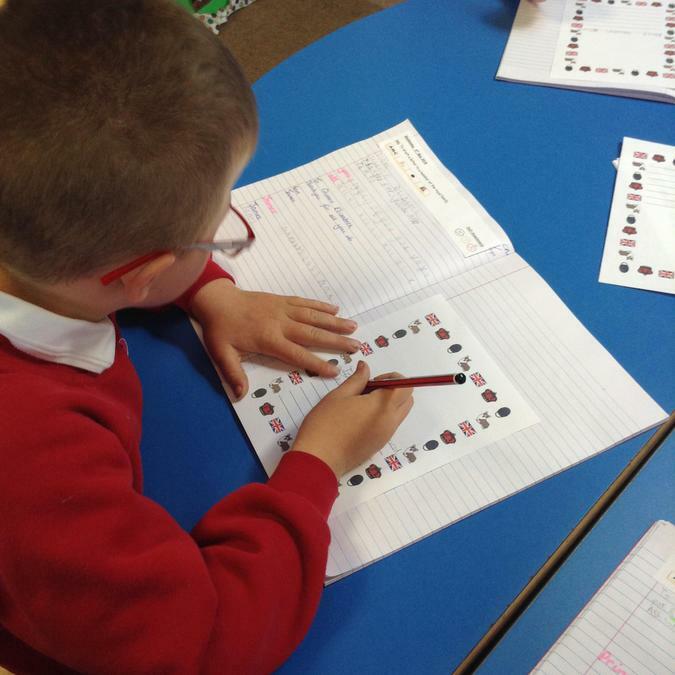 We worked on doubling a given number and writing the different number sentences for them. 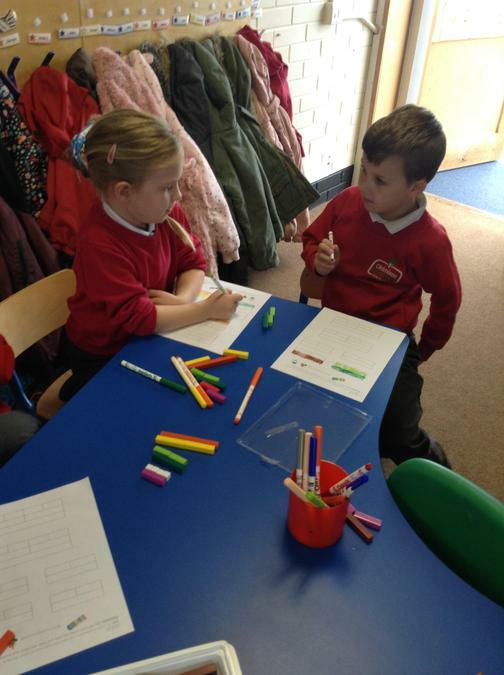 Also we have used bar models to show equal groups of a number and we have used number lines to show equal jumps and recorded the number sentences to go with them. 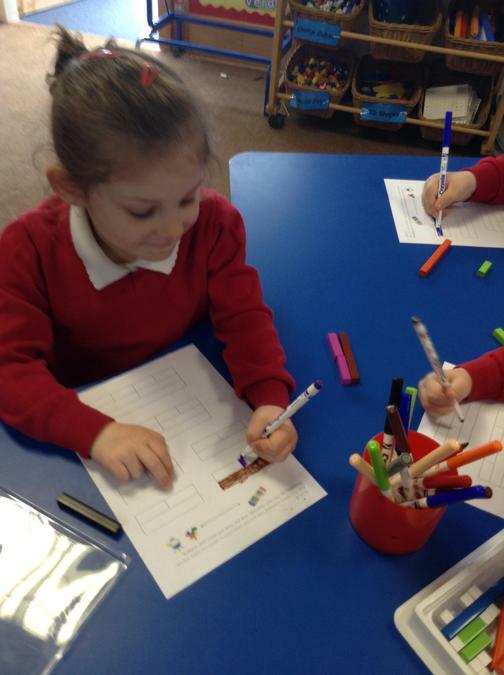 For our English work this week we started the week by planning out the story of ‘The Queen's Hat’ using a story mountain and concentrated on the beginning, middle and end. 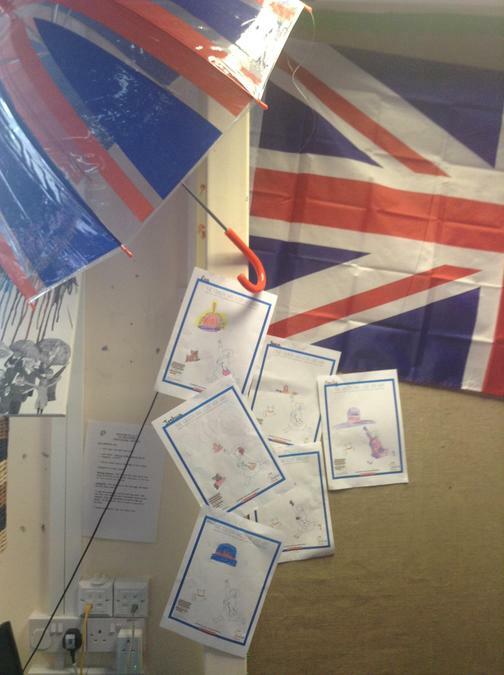 Then we thought of different way to describe the Queen's hat and how it moved across London and wrote our own descriptions. 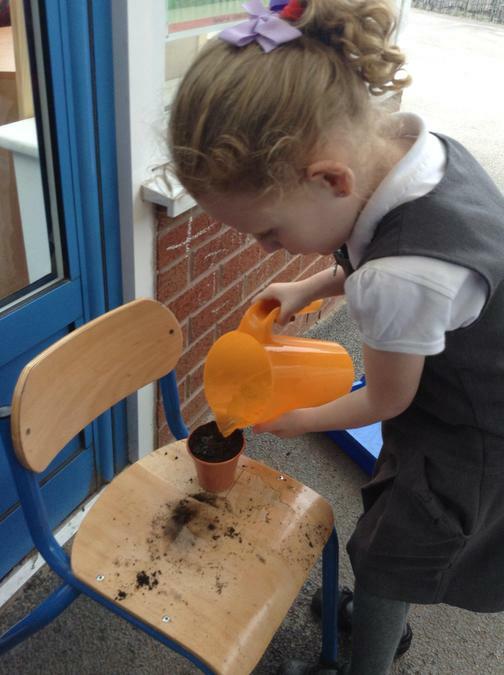 Also this week we have written our own stories like ‘The Queen's Hat’ but we have changed the thing that blew away and the places it goes. 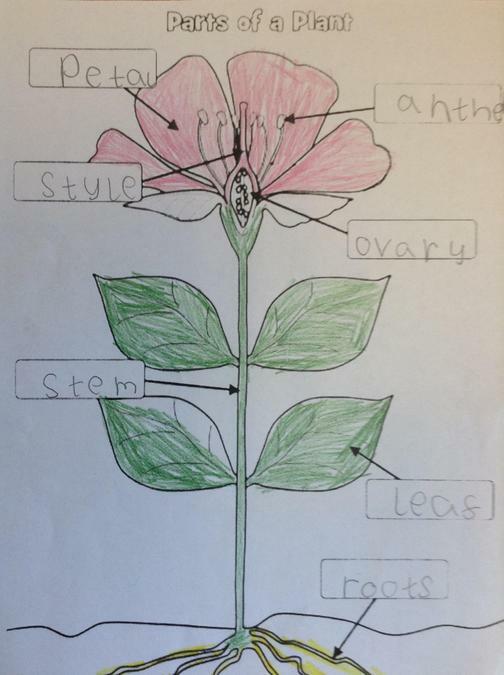 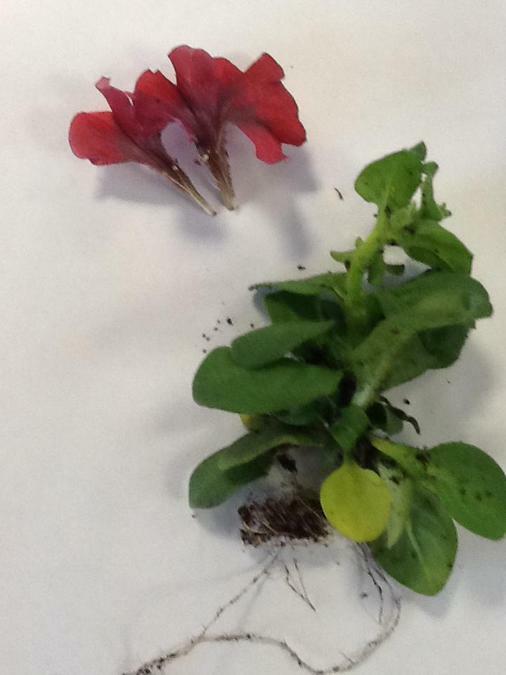 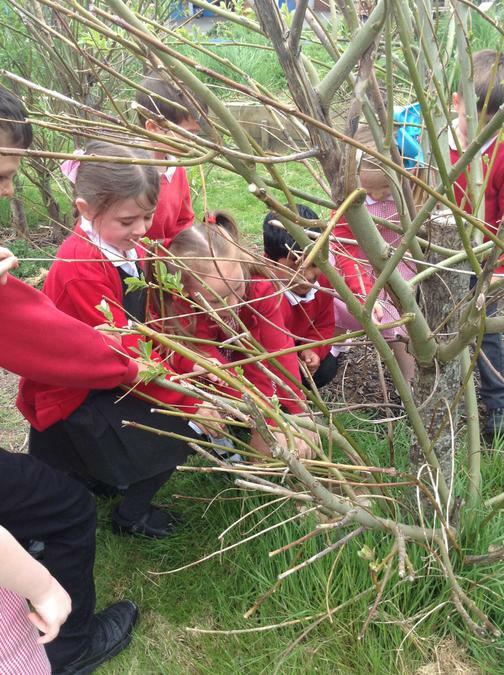 For our Enquiry work we have started to look at the parts of a plant. 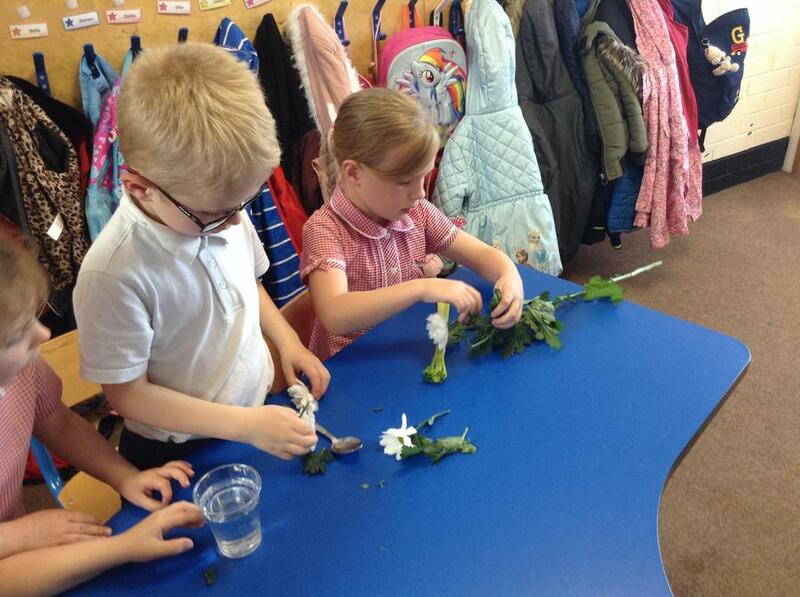 We looked at some plants and took them apart and then talked about what the different part do and labelled our pictures. 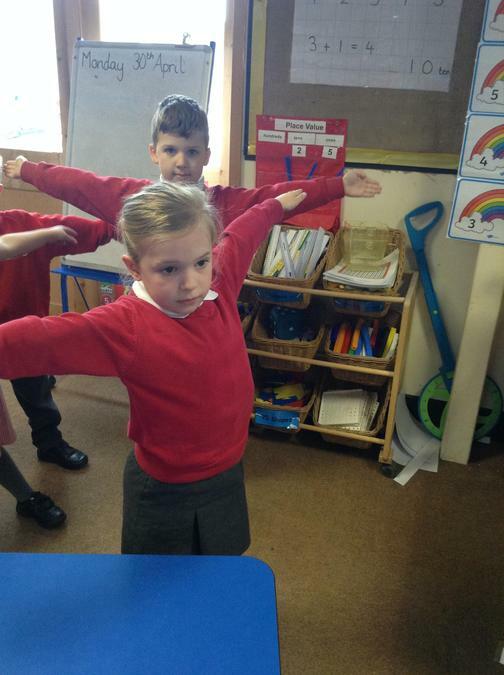 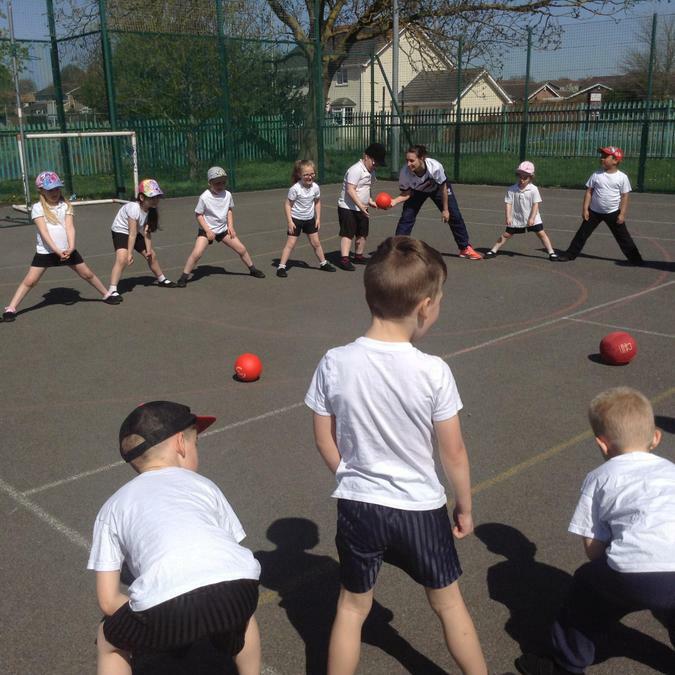 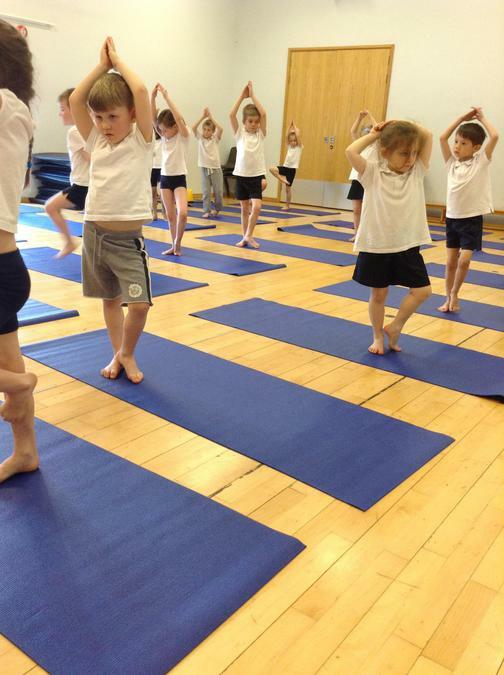 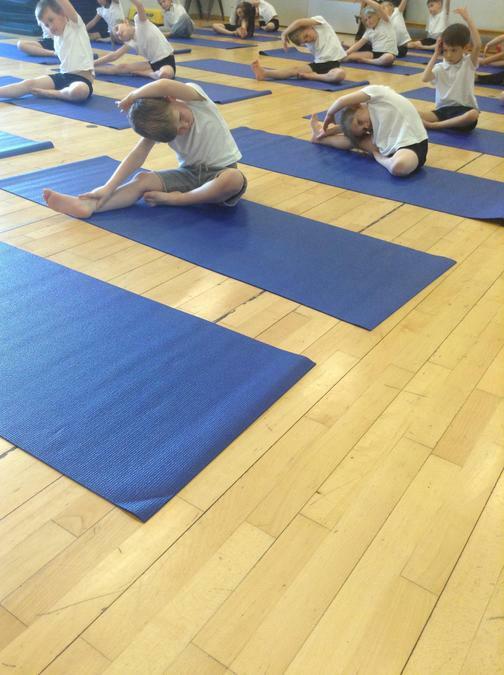 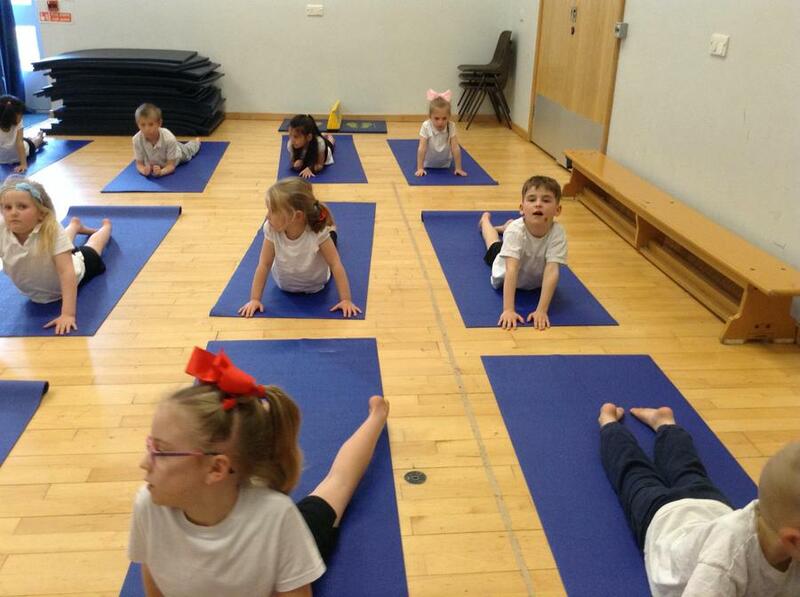 In P.E we have continued with our Yoga work learning new poses and stretches and we have been working on our ball skills. 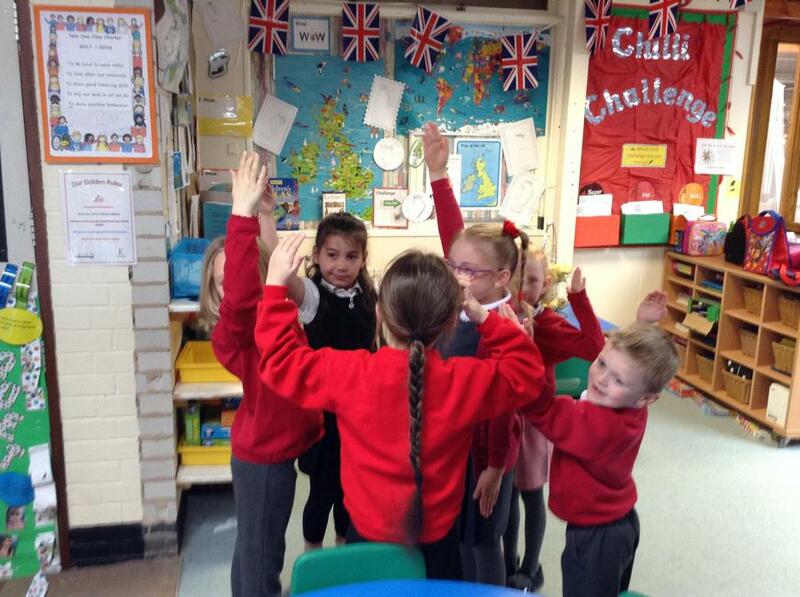 Welcome back to term 5 we are going to be very busy with our Enquiry Learning which is linked to the capital city of London. 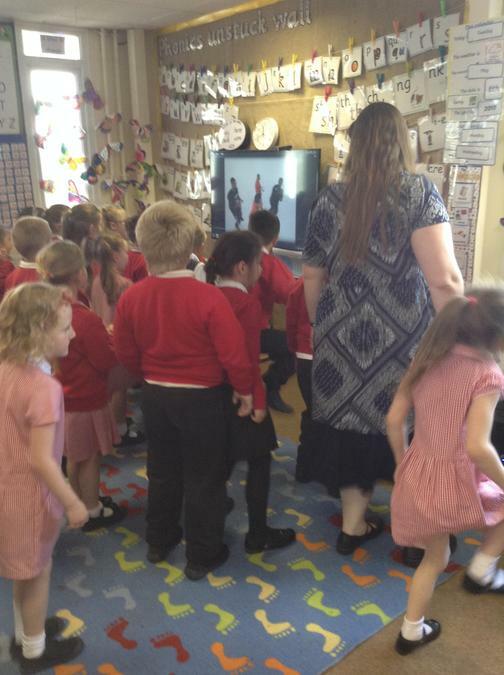 We have started looking at what we know about London and what else we would like to learn about the city and the other cities in the United Kingdom. 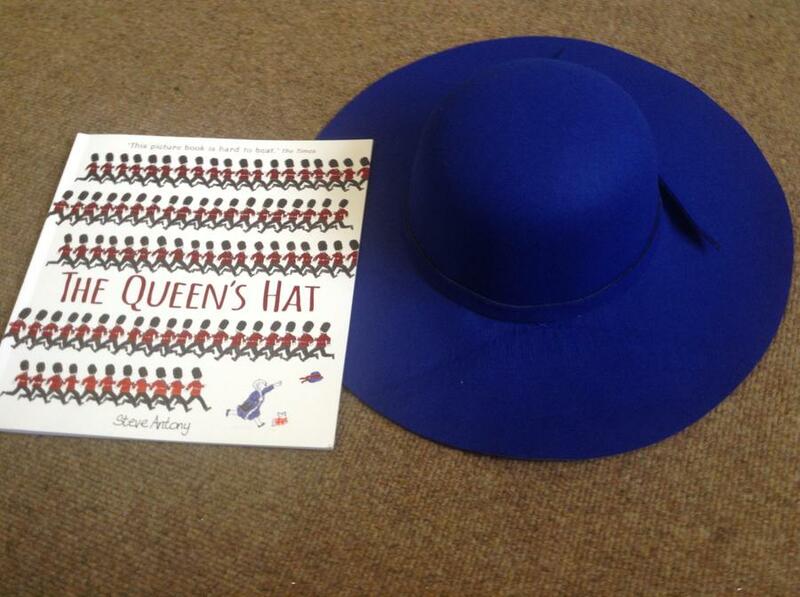 Our story is the Queen's Hat, which flies off the Queen's head and across London, with lots of famous landmarks whizzing by. 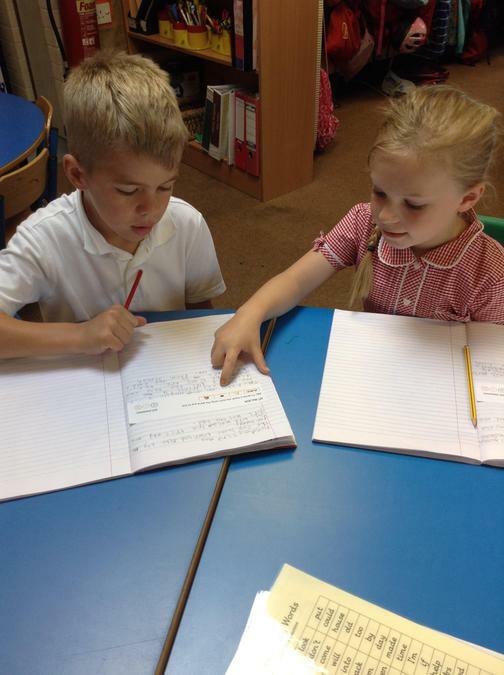 The children have made a fantastic start to their writing, as we have had some amazing diary entries by the Queen about her day and pretended to be a news reporter and wrote some really interesting reports about the day the Queen lost her hat, including lots of facts and details. 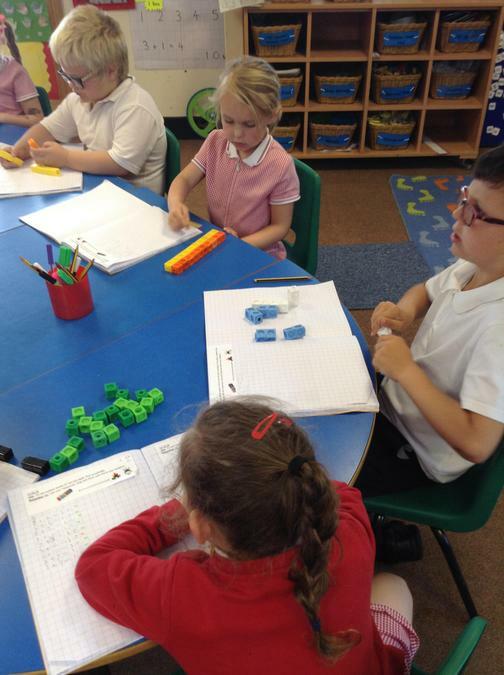 In Maths we have started looking at multiplication. 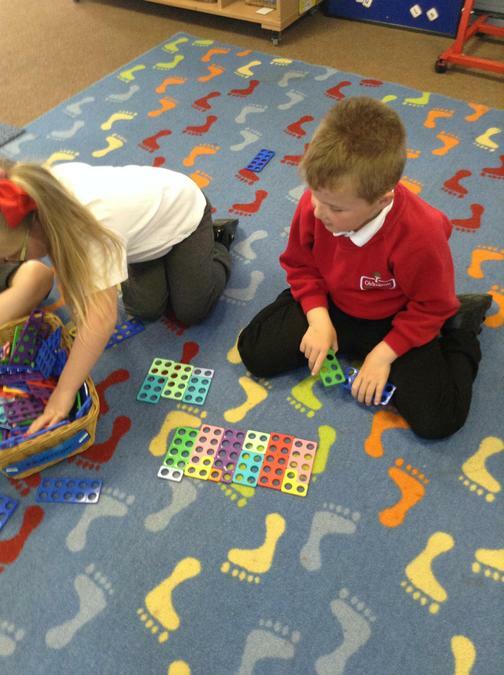 we have been sharing out equal groups of items and counting them, spotting patterns in the growing numbers, making arrays and recording them discussing columns and rows of items. 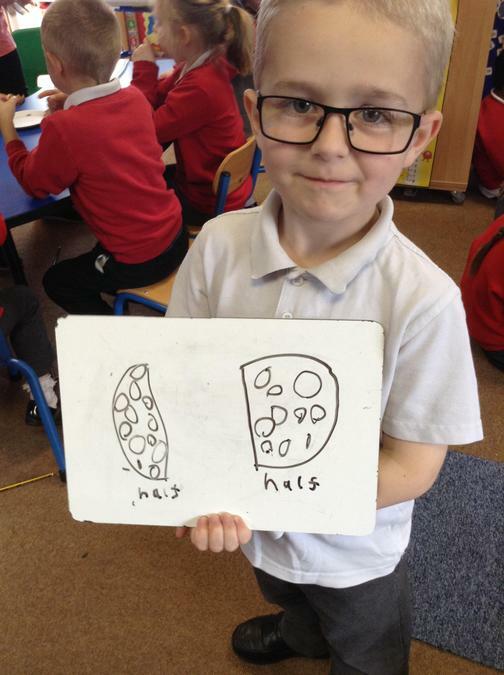 then the children have started to use the mathematical symbols to write out the arrays they have made: 2+2+2+2+2=8 and 2x4=8 etc. 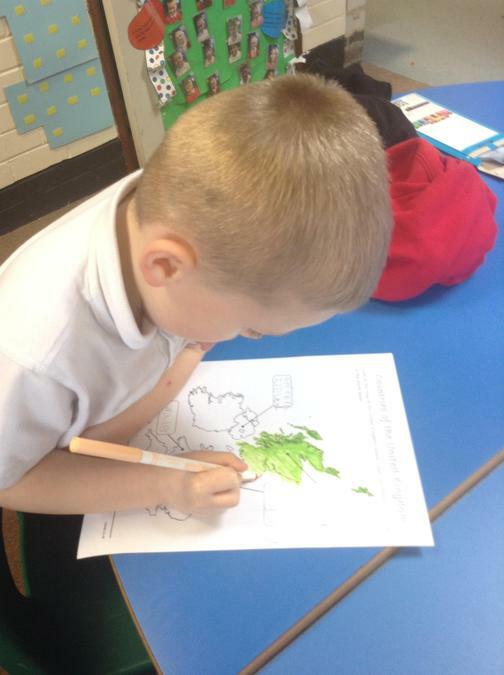 Our Enquiry topic has started by finding out about the different countries that make up the United Kingdom and the children have asked to find out the names of the cities in each country. 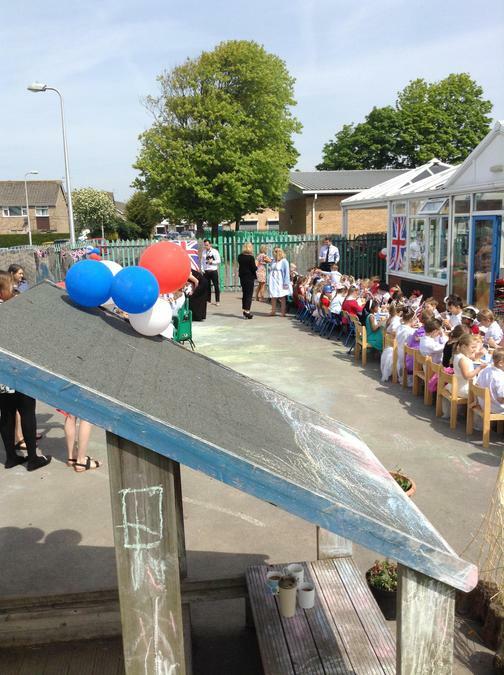 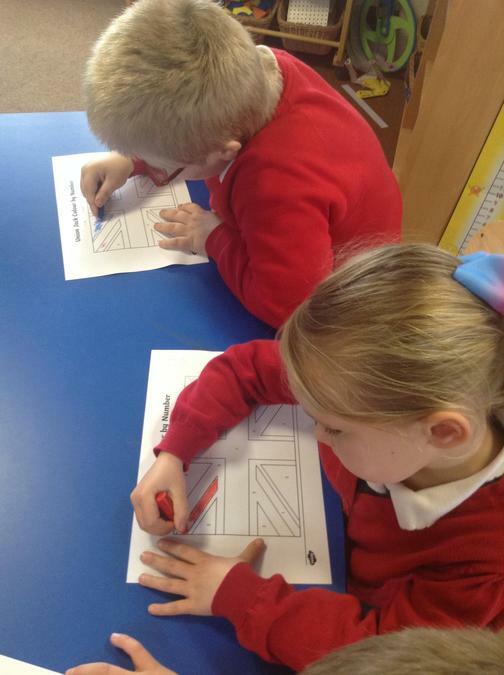 The children have also enjoyed looking at the flag of the United Kingdom and coloring in their own to create bunting to decorate our classroom. 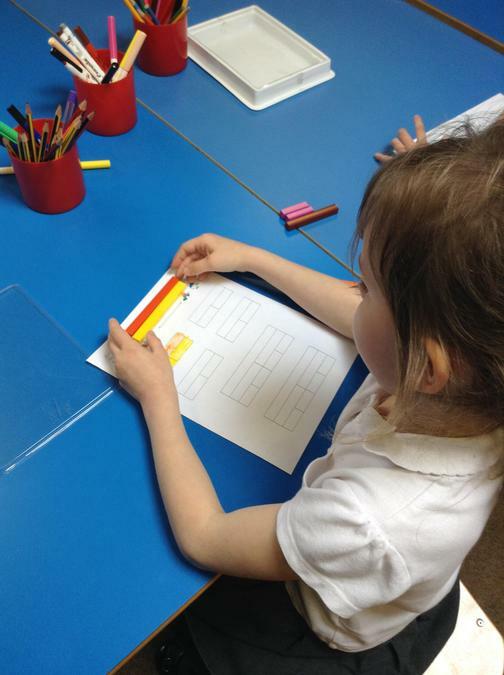 They were really interested to find out that it is made up from different flags. 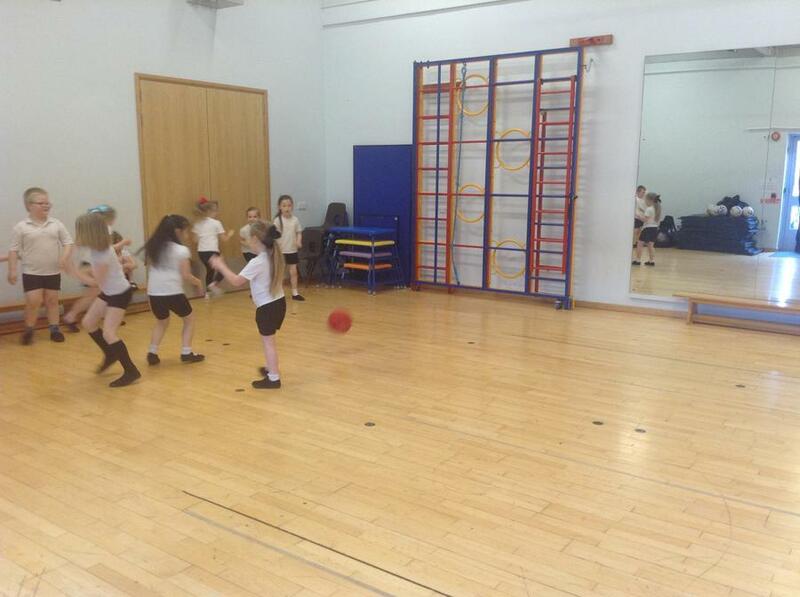 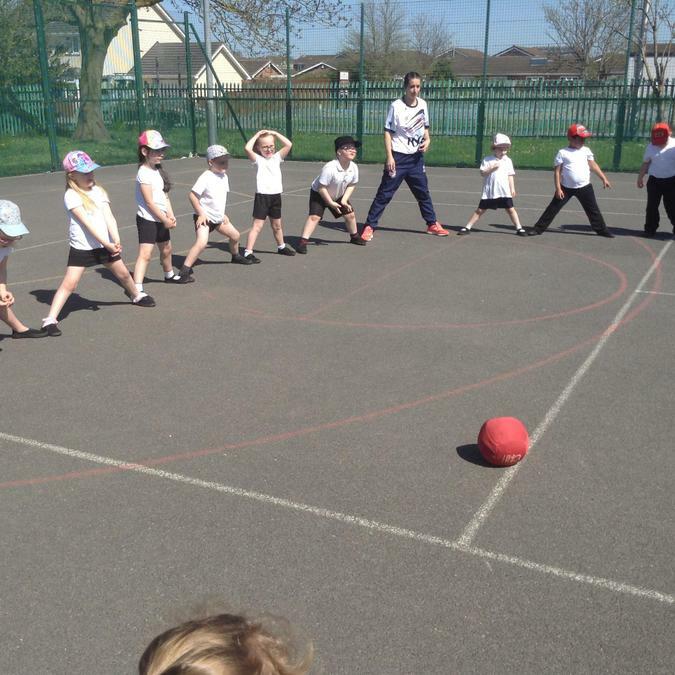 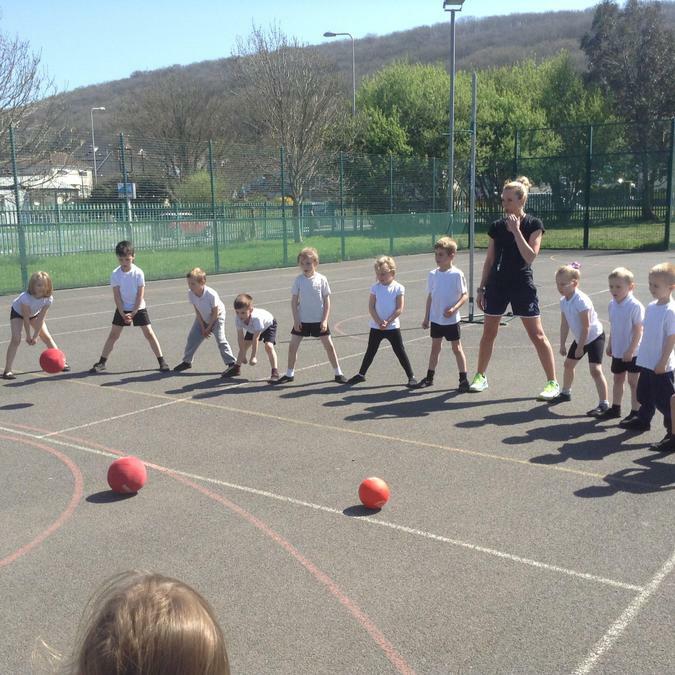 For PE this term the children are practising their ball skills for netball and dodgeball and will be learning these two team games.